With tons of companies in the web hosting industry, it is very difficult to choose the best one. Both BlueHost and GoDaddy are well-known names. BlueHost famous due to its hosting services while GoDaddy made its name mainly because of domain registration and after that, they start hosting services. Both aims to provide the hosting at low rates. Both have plenty of happy customers. So for solving this mystery who is best, we do BlueHost vs Godaddy side-by-side comparison. We are hopeful that this comparison will greatly help you to select which one is better for you. BlueHost is the best WordPress hosting provider and offers a free domain name for one year when you purchase hosting plan. If you are going to use WordPress CMS then choosing BH would be a great option. GoDaddy is the cheapest domain registrar and you can grab your domain just $0.99 for the first year. But we don’t recommend using hosting from them. Their plans are a little bit costly than BlueHost. Uptime is a period during which your site is online over the internet and people can access your site or purchase your products. So, it means excessive downtime will affect your business and reputation. BlueHost is not offering any uptime guarantee while GoDaddy offers 99.9% guarantee. But just offering Guarantee is not enough, look at the below statistics. During the testing period, we found that in most of the month BlueHost servers Uptime was 99.99 % and even 100% in some months. While GoDaddy is not focusing on its servers uptime and that’s why we face the minimum of 99.85% and maximum 99.99%. Also, they manage to deliver 100% two months in a row. In personal experience, we found Bluehost is better than GoDaddy in term of server stability. Website loading time is the amount of time to fully load a page. If your site takes more than 3 seconds to load then, users will get frustrated and ultimately leave your site. Also, slow websites are the cause of low ranking in search engines. But as per our tests, using Pingdom and GTMetrix tool, BlueHost perform better than the GoDaddy. BlueHost’s hosted website average load time is below than 796ms while GoDaddy takes almost 3.54 sec to load a page. Here note that we install WordPress on both of them and does not install any of the plugins. Solely we did not experience the high page load time with GoDaddy, there is also tons of customer complaints about their uptime and low-speed servers at BBB. Another way to reduce the page load time is CloudFlare, which made the cache of static contents of your site so that to deliver quickly next time. BlueHost includes built-in CloudFlare option in their panel and you just have to hit a few clicks to activate it, but GoDaddy doesn’t include such a useful option, this means if you want to enable it then do it manually. No matter if you are an expert, you can’t say that you can handle all the issues. Technology changes day by day and new real-time issues arise by anytime. So, you will need an expert and knowledgeable support team to cope with serious issues. Both companies provide support services 24/7 via phone and tickets. Sometimes due to some problem, the company is not able to render help at the spot but you want the solution right now. A knowledge base is a place where the company gathered data on all of the topics and faqs. Both of the providers maintained tons of guidelines. So at that time instead of waiting, visit the company help center, which is maintained on their official site. There you can search for the issues and solutions. Moreover, both of them also offer a community forum where you can post your issues. In this BlueHost vs GoDaddy comparison, uptime, prices, and customers support features are one of the must have features, but these are not enough. We have to compare all the prominent features which are the basic requirements of every blog and website. In simple words, Bandwidth is the amount of traffic that a website can handle. Both are offering unlimited bandwidth on all of their plans. Web space is where you store all of your websites’ files, images, videos, and text content. GoDaddy offers 100GB storage on its Economy plan (very basic plan) while BlueHost offers 50GB (it is more than enough, generally websites don’t take as much). Both BlueHost and GoDaddy offer to host one website and 25 subdomains on their basic plans. Moreover, both companies offer you one free domain name at the time when you are going to sign up for a hosting plan. Backup is just like the life-saving of your site. When you messed up with your site because of some plugins or any kind of changes then what you do? Here is the short, easy and secure way to restore the files that you backed up. BlueHost includes free backup facility, which automatically does the weekly backup while GoDaddy charges $1.99/mo. for backup & restore. CMS installation is never easy as before, developers make it easy especially for the newbies having no or very limited skills. Now via 1-click installer, you can install plenty of applications within no time. If you want to install WordPress, which is the most popular and leading CMS, then there is a separate option of “WordPress” in the Cpanel. It just requires a few clicks and done. How do people get to know about your business? The answer is “Advertisement”. You need to advertise your blog and website i.e. make awareness of your existence. But advertisement is not free you have to spend handsome money on it. Bluehost does not offer advertising credit in its “Basic” plan. But if you are going to purchase “Plus” or “Prime” plan then the good news is that they offer free $200 Ads credit along with hosting. But GoDaddy does not include such offer in any of its plans. It is the time period during which you can make a request to return back your funds. It happens when you did not satisfy with the company services and want your money back. BlueHost offers 30 days money back guarantee. But after 30 days you still have the chance to get the prorated refund. On the other hand, GoDaddy only offers 30 days to ask for the refund. And if you purchased a monthly plan(less than a year) then you get only 48 hours for requesting the refund. BlueHost has three plans; basic, plus and prime. The “basic” plan seems a bit limited as you can host only one website but this plan is the best hosting for small Business/bogs. 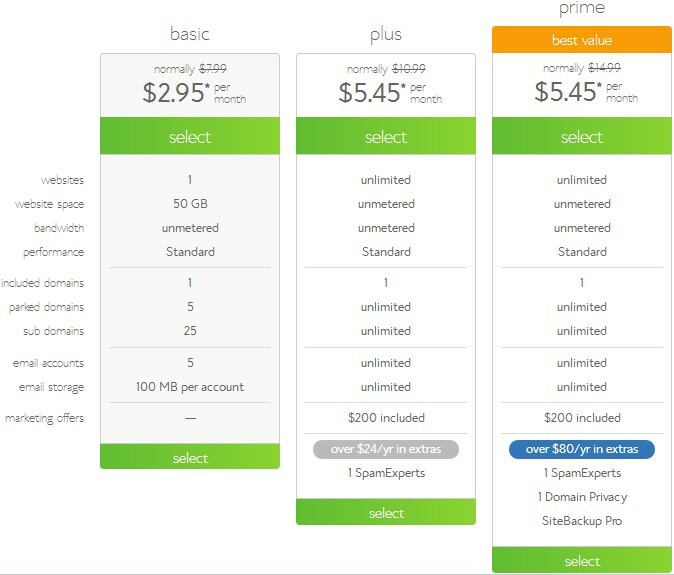 You can host unlimited domains if you purchase a plus or prime plan. GoDaddy also offers three plans namely Economy, Deluxe and Ultimate. GoDaddy offers 50 GB more storage in its Economy plan. When it comes to the prices, at regular the cost of plans are exactly same. 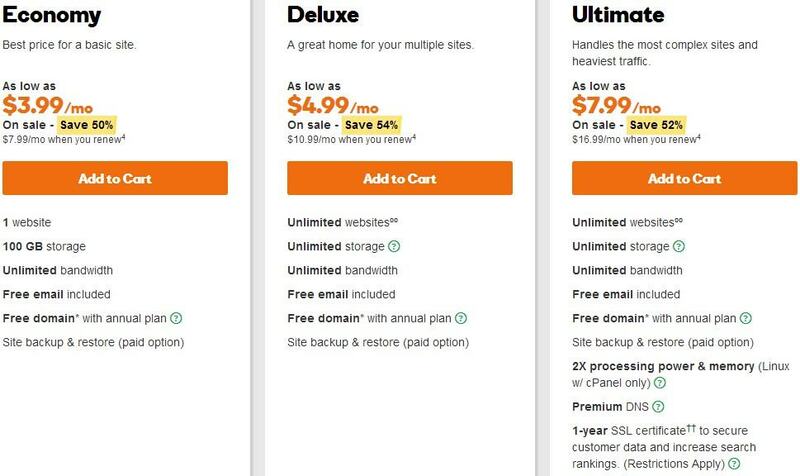 But GoDaddy offers bigger discounts on its higher plans (Deluxe & Ultimate). Do these both companies value your spending and offer enough? If we take the GoDaddy, their plans are much similar to BlueHost on regular prices while both of them offer big discounts frequently. BlueHost plus plan includes unlimited labeled features. On the other hand, GoDaddy (Deluxe plan) also includes unlimited features but offer no free backup & restore. Moreover, GoDaddy does not offer the built-in CloudFlare option and impose the restriction on the storage of databases. And if we compare the prices of the plans then GoDaddy is a bit expensive after adding the cost of backup & restore option. Once you have completed the signing up process, you get a control panel for site management. Through cPanel users can control over the CMS’s installation, establishing domains, creating databases, Mails management and many other features. Currently, both are providing a user friendly cPanel which is common in the industry. But BlueHost made few changes and polish the panel like new icon and color schemes etc. So if you are not sure to decide in BlueHost vs GoDaddy on the basis of visibility, usability, and reliability of panel; then don’t worry both are almost same. Webmaster can build their own customized designs with website builders. But time was gone when you need special programming skill to build a site. Now with the help of Drag and Drop builder, anyone can build its own design. BlueHost includes a free site builder “Weebly” in its hosting plans. Just log in to cPanel here you see Weebly just click on it and start building with tons of free templates. The free version also includes basic SEO support, which helps to prevent the anti-SEO factors. Because it’s a free version that’s why it has limited features like the limited number of pages and absence of “import themes” option. But the thing is, there are many site builder better than the GoDaddy. So if you are going to spend your money then why shouldn’t spend on those. Although, BlueHost offers limited site builder but it’s kind of good favor. Now we are going to discuss some common features which are also important along with all the above features. These features are developed for the ease of the users. So before purchasing any hosting check out that if the company offer these features. Like 1-click installer, php version, phpMyAdmin, File manager, FTP access, Email forwarding, email accounts, etc. Both companies hosting packages include all of these features so that users can perform the operations quickly and without any advance knowledge. Under this, we describe the special technology offered by the company which has effects on hosting quality. Many companies offer their own made technologies to gain edge over the competition like SiteGround. So in BlueHost vs GoDaddy head to head comparison whose got the special tech? GoDaddy does not offer any special own crafted technology, which helps to enhance server performance and ultimately reliable services. This also shows that the company mainly focus on its domain registration business and neglecting hosting. While on the other hand, BlueHost servers equipped with some great technologies like resource protection. Resource protection helps to protect each user rights and isolate those sites on the same server having traffic spikes. Also, they support scalability in a case when you want to shift to VPS or Dedicated plans. So, in this era of competition if GoDaddy wants to compete then they should introduce some own crafted technology to gain a competitive edge. Based on the above BlueHost vs GoDaddy voting, BlueHost got more vote than GoDaddy. As per our experience, we recommend BlueHost because they offer good uptime and support services, which are the basic requirement of any business site or blog. Moreover, they are listed on at the top spot on the official WordPress.org page. So in a BlueHost vs GoDaddy battle, we surely recommend BlueHost for small to a medium website and especially for those who just want to start. But if you are looking for cheap WordPress hosting and have a limited budget then grab GoDaddy plan.